Home/Should you rely on intuition? One of the games I play with my colleagues is : “Guess the relationship”. The rules of the game are simple. When we are in restaurants each of us makes a hypothesis about the relationship between people sitting at another table. We discuss our intuitive sense of their relationship. If everyone agrees to your hypothesis you have to get up and check at the table in question if your hypothesis is correct. 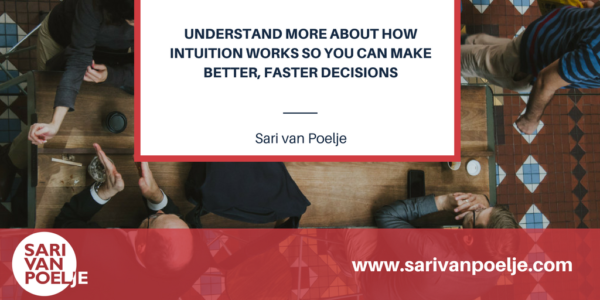 Intuition plays a large part in expert decision making. To accelerate learning we need to understand more about how intuition works so we can make better, faster decisions. As we saw in the previous article, intuition is based on learning from experience. People learn from experience in a number of ways, for example we make mental connections between things that happen together in time and space – we’re wired to notice frequencies. These connections then become reinforced in memory. We are genetically more prepared to learn the significance of certain stimuli and because we are the product of evolutionary adaptations we also possess learning that was more useful to our ancestors than to us today. In real terms this means we tend to fear spiders and snakes more than we tend to fear traffic and crime. The frequency of connection between punishments and rewards affects the ease of establishing connections, and once a connection has been reinforced by an external reward people are reluctant to change their behaviour. The more complex connections give rise to rules, giving us the ability to infer relationships between variables. Regression towards the mean. A salesman’s performance may be good one day, and bad the next. Then after an intervention they may improve. Our intuition may tell us that it was our intervention, but the improvement may have nothing to do with your intervention but with regression performance towards the mean. We have inferred an incorrect correlation between variables. Illusionary correlation. This happens when two events occur together but are in fact not related. A good example, a doctor diagnosed typhoid fever from palpitating the tongue of a patient, but he did not realise he was the carrier. He mistakenly made a mental connection between things that happened together in time and space. Gambler’s fallacy. In a game of chance, for example turning over playing cards from a deck, most people believe that when red has appeared five times in a row that a black card will be more likely to occur afterwards. In fact the chances remain 50-50. Conjunction rule. The probability of a conjunctive event (an event composed of more than two components e.g. man smoking pipe) is smaller than probability of each component occurring separately e.g. meeting a man and meeting a pipe smoker. Fundamental attribution error. In social life the accuracy of our intuitive judgements is affected by known fallacies such as the fundamental attribution error where people tend to attribute observed behaviours to personality factors as opposed to characteristics of environment. So, should we stop trusting our intuition? No, there are ways of building your intuition and learning when to trust it and when to question it. Try the RATE to find out if your intuition can be trusted. What did I notice that supports my intuition? What facts do I have that supports my intuition? What people could I check in with to test this intuition?